I picked these up late last night at my local Sprouts and of course I had already blown all of my macros for the day so I was dying all night having to wait until today to try these! All I had to see was 70 calorie Fudge Bars & 100 calorie Ice Cream Sandwiches and I was SOLD! Did a little more research on them via their website and I’m highly impressed! They are all packed with protein, fiber and light on calories, fat, and sugar. And the best part….THEY TASTE GREAT! They currently offer 5 flavors of ice cream bars (fudge, coffee, orange cream, peanut butter & toasted almond) and 2 flavors of ice cream sandwiches (vanilla bean & mint). ENLIGHTENED Ice Cream Fudge, Coffee, Orange Cream, and Toasted Almond bars contain 70 calories, 8 grams of protein, and 5 grams of fiber. They contain only 3 grams of sugar and 2 grams of fat. ENLIGHTENED Ice Cream Peanut Butter bars contain 80 calories, 9 grams of protein, and 5 grams of fiber. They contain only 3 grams of sugar and 2.5 grams of fat. 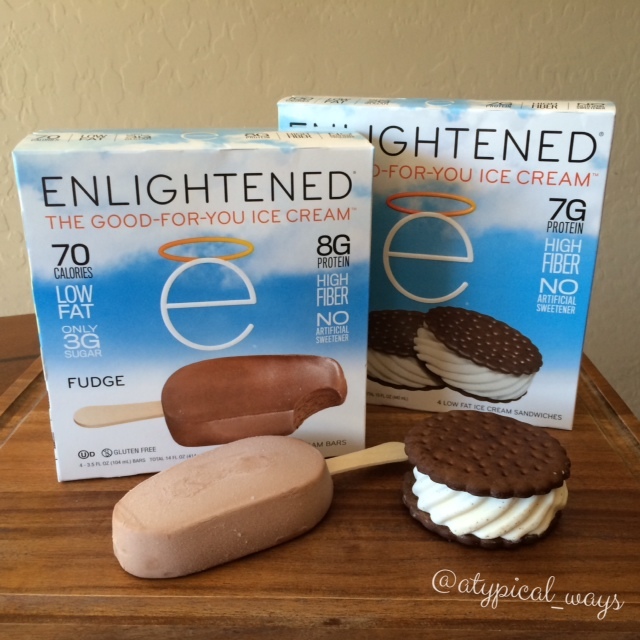 ENLIGHTENED Ice Cream sandwiches contain 100 calories, 7 grams of protein, and 5 grams of fiber. Our sandwiches contain only 2 grams of sugar and 2.5 grams of fat. « Quick Blueberry & Banana Protein Shake – with simple ingredients!